The alarm wakes me from a fitful slumber. Uggh - the sheets are sweaty, and so am I - and I'm the only one in the bed. That's no fun. Despite drawn shades across the new insulated double-pane windows with their special radiation-reflecting glass, the bedroom's position on the west side of the house has allowed the afternoon sun to raise the temperature in the room to over 80 degrees F, even though it's dropped into the lower 60s outside (that's 27 and 16, respectively, for those of you who speak Celsius). I'm in luck - no line at the In-N-Out Burger. One double-double animal-style, no sauce, extra toasted, and a large drink to go please. No fries, thanks. I hit the top of the stairs and look around the tower cab. Lotsa folks here tonight, so after checking in with the supervisor and reviewing the R & I (Read and Initial) Binder, I'm assigned to Helicopters. Thus begins another Midshift, my second this week; what other professions refer to as "the graveyard". We try to avoid that term in ATC. The waning crescent moon is slowly working its way up from the eastern horizon while the lighted pylons alternate through their Easter colors. The rush of trans-Pacific and Central American passenger flights has departed. The last of the late folks have long since gone home, and the midshift crew soldiers on into the night. Two of our four runways are closed for construction, as are several usually-crucial taxiways. The only thing on frequency is a LAPD helicopter patrolling the area east of LAX, and the next arrival is some thirty minutes away. I open another Diet Coke. This is where passing on the fries earlier pays off: all that starch would be a serious handicap right about now. Between 2 AM and 4 AM is the hardest stretch at LAX. My compatriot and I try to find things to talk about: The Lakers lost (although I will admit to rooting for New Orleans). Who's bidding out. How various trainees are progressing. Or not. Who's the most likely candidate for the currently vacant supervisor position. Despite having taken a 5-hour energy drink just a couple of hours ago, he yawns. We're not allowed to have unofficial materials in the tower cab, be they magazines, a radio, crossword/sudoku puzzle, or cell phone, as most of the time they would constitute a distraction. Right now, they would be an avenue to keeping some sort of mental function going. So far, no one's called me out on having the camera, so I take a picture of the rising moon. Time to make a new ATIS. The list of taxiway closures is longer than the weather sequence. Still over four hours until sunrise. One late heavy taxies out for departure, having earlier returned to the gate for some sort of mechanical issue. Their original gate was taken by a waiting aircraft when they taxied out the first time, and so now they're coming out of one of the remote gates at the far end of the airport. It'll easily be a ten-minute taxi or more for them to reach the runway. They're nearly four hours late, and they've still got a twelve-hour flight ahead of them. The Philippine B747 reaches the end of Runway 25 Left at the same time that Fedex turns a ten-mile final for 6 Right. Fedex would really like to have the south side so that they don't have to taxi all the way across the airport, which costs them several hundred pounds of fuel. To give it to them this time would require the already-late departure to wait some more. Sorry guys, maybe next time: Runway 6 Right, Cleared to Land. On about two or three-mile final, he asks "Verified cleared to land." It's been a long night for him, too. City Ops requests the lights be turned on for one of the closed runways. After a check from one end to the other, he advises that it's now open. Time to make another ATIS. Still another fifteen minutes before our next arrival, another Fedex. He gets to land on 7 Right, after also asking for confirmation of his landing clearance. The supervisor contributes a little to the gossip between yawns. He's run out of paperwork to shuffle. I look at the national weather radar map: There's an ugly line that extends from Lake Charles, Louisiana, across the state of Mississippi to Memphis, Tennessee, and on up into Kentucky. Another weather system runs along the Canadian border from the great lakes to the east coast. I have plenty of time to reflect on the benefits of being in Southern California. The supervisor asks us to check the battery-operated back up radios. The arrival of the new hourly weather observation spawns yet another ATIS. The first of the day shift arrives, and gives my compatriot a break from ground control. Somebody new to talk to! Like my fellow midshifter, he's a former controller in the Marines; they're both part of our new generation of controllers. We compare notes about our cars, and conclude that automatic transmissions are boring. The cleaning crew arrives in the tower cab and turns on the overhead fluorescent lights. The glare pretty much means that we can't see out the windows, but there's nothing to see: Our next arrival, another Fedex, isn't due for another twenty minutes. I call the Arrivals controller and tell him that he can run to 7 Right until further notice. We move around the cab to get out of the way of the two-man cleaning crew as they empty trash cans, wipe down all the counters, dust everything, and vacuum. They're working a lot harder than we are: I help push the chairs around. The cleaning crew has finished, leaving us once again in darkened solitude. But now there are things to do: A gaggle of freighters is arriving at the same time as the first wave of the "pineapple express." The pineapple express is about a dozen passenger flights from Hawaii that all arrive at LAX between 4:30 and 5:30 in the morning: United, Continental, Delta, and American are all straight-in for 7 Right, and have been more or less since they took off four hours ago. Their arrival signals the end of this shift's doldrums. We listen as the arrival controller melds the Fedexes, Mas Airs, and UPSs from the east with the passenger jets from the west. In the midst of all the B757s, B767s, DC10s, MD11s, and heavy Airbuses, is a charter jet with a callsign that none of us recognize. He slows to a crawl on the runway after landing, and tries to make a close call out of what had been generous spacing on final. The parallel runway is still closed, so a last-minute sidestep is not an option to prevent a go-around. He finally clears the runway as the next arrival is over the approach lights, much to the supervisor's consternation. The last thing he wants to be doing at five in the morning is more paperwork. Several pilots ask for wind checks on final, and a couple of them mention that the wind is strong out of the north until just a few hundred feet above the ground. Our first departure in nearly an hour taxies out. I call down to Arrivals and ask him to put the last two on the north side. As the last 7R arrival rolls out, I load the departure on 25L. 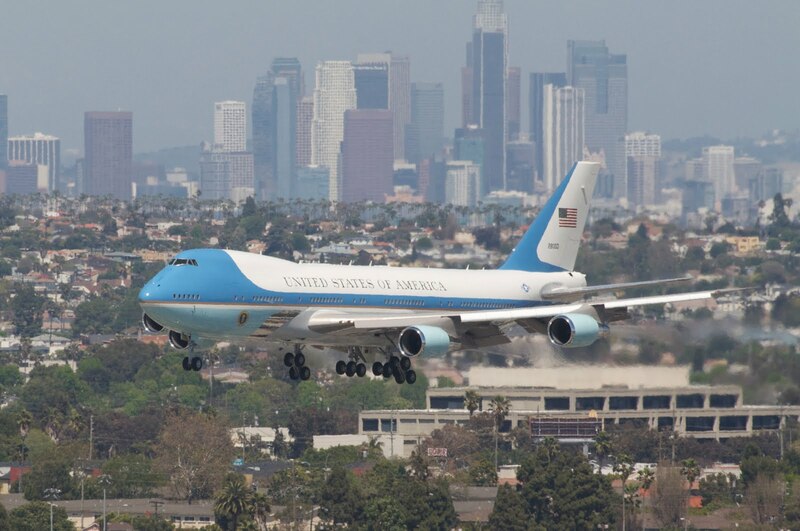 At the shoreline, he makes a turn to the south away from the traffic on final for 6R. The sky is beginning to lighten in the east; I can make out the silhouettes of the mountain peaks as Venus, the morning star, rises. The supervisor livens things up by pointing out that we're "in the minutes" - meaning that we have less than an hour to go. We're in the home stretch. The flight plan printer comes alive and starts printing out strips for the first wave of departures. These are all pretty much headed east to various hubs: O'Hare, Atlanta, Newark, DFW, Memphis, Houston, JFK, Miami. We normally get the strips half an hour before the flight's proposed departure time, so these will all be in the air by six. Ground control has several tugs repositioning aircraft from the maintenance ramps to their assigned gates. My last arrival says he'll exit at H-1, but turns onto G instead. No harm done. Fair's fair: We changed his runway to accommodate a business jet departure and then changed it back again to let him land on the south side once the biz-jet was gone. My relief plugs in and I start the position relief briefing. Between the last of the pineapple express and overnight freighters, we have a lull before the first of the sunrise departures. We have a checklist for the briefing, and so I get to go into some detail to tell him that nothing is going on. Yet another former Marine, but he's closer to retiring than I am. We chat for a couple of minutes during the required overlap period, and then I unplug and make sure I'm not leaving my favorite pen behind. I greet the incoming morning supervisor at the head of the stairs, and then head down to put away my headset (and favorite pen) and get ready for the final hurdle: The drive home. Okay, so yes. Despite the poor quality of the photo, many of you noted that this appears to be what we call a "Golden Towbar" in progress. For those unfamiliar with the term, a golden towbar is what we call it when a controller gets himself (well, his planes actually) into a situation that can only be solved through the use of a towbar (and presumably a tug with it). It is a moment celebrated by all of one's coworkers, mainly because they're ecstatic that it wasn't their faux pas. As several of you noted in the comments, this is a face-off between the Southwest B737 exiting on Taxiway Yankee and the Emirates B777 taxiing westbound on Taxiway Echo. Southwest has just landed on Runway 24 Right (as the United Airbus is doing in the background) and made the mid-field exit. As one of you mentioned, this is a common practice for Southwest, as they park at Terminal One. Missing this exit adds about a mile to their taxi back to the terminal. (Refer to Airport Diagram) The mid-field exit on Runway 24 Right can be Taxiway Zulu (aka "the forward highspeed") or Taxiway Yankee (aka "the reverse"). Taking the reverse is a bit more work for the pilots, as it's much more than a ninety-degree turn and requires coming nearly to a stop on the runway to make the turn. It also requires us to have enough space for them to have time to negotiate the turn and exit the runway before the next arrival reaches the threshhold. For whatever reason, many more Boeings make this intersection than do Airbuses. I've seen Air France B777s make the turn and exit at Yankee, although the usual perpetrators are Southwest and, to a much lesser extent, Alaska and Westjet. Back when Taxiway Sierra was still open, the Skywest E120s, CRJ7s, and Eagle Flight E140s would make this exit as well. Nowadays we direct them off onto Taxiway Zulu instead, as that puts them in position to use Taxiway Romeo to the south side of the Terminal complex. For some reason the Skywest CRJ2s hardly ever could make this intersection even though the larger CRJ7s would. Meanwhile, Emirates is westbound on Echo because they require Runway 25 Right for their departure, as at least one of you postulated. This is another common practice at LAX; many of the long-haul departures require Runway 25 Right, which, at more than two miles from end to end, is the longest of our departure runways*. As a result, we frequently have to take large airplanes from the north side terminals around to the south side runways. In another Brand A versus Brand B conundrum, many more big Boeings seem to require Runway 25 Right than do big Airbuses. In fact, it's common for us to do just the opposite with the Airbus 380: It'll be parked on Gate 101, at the south end of the International Terminal, and taxi around to depart off of Runway 24 Left. So now, with all of that out of the way, it's True confessions time. Yours truly is Controller B in this scenario. "Controller B" is another term that we use amongst ourselves, and refers to the second controller involved in some sort of occurrence. "Controller A" is the primary controller involved, and would in this case be the north side Ground Controller. One of the Ground Controller's main responsibilities at LAX is to keep the runway exits clear, so that aircraft coming off the runways can do so without impediment. GC: "After Southwest, I'll be upstream with Emirates." No, it's not quite by-the-book phraseology, but it normally gets the job done. As you might have guessed by now, said coordination didn't happen this time around. I was working the north side Local Control position (what most non-controllers think of as "tower") at the time, and gave Southwest instructions to cross Runway 24 Left and contact ground. My Assist (another controller whose function is to act as another set of eyes and ears for the Local Controller) and I then idly wondered if Emirates was going to the south side as we watched Southwest make the turn onto Yankee and head across the Left while Emirates began to taxi out of the D-10 alley. Since the ground controller hadn't said a thing and there was no traffic for the inboard runway, we weren't terribly concerned either way. This was shortly followed by my assist saying something along the lines of "Golly gee, he is!" Okay, so I paraphrased that first bit just a little. It looks like the same picture, but note the positions of Emirates and the United Airbus arriving on 24 Right: This shot was actually taken a second or so before the first one. While the positions of United and Emirates are different, Southwest can be seen to be stationary: We stopped Southwest short of Taxiway Echo to allow Emirates to go by, a maneuver were able to get away with because there was nothing happening on Runway 24 Left at the time. Alternatively, if we had really needed Southwest to clear the runway, he could have been told to make the hard right turn onto Echo westbound. Not an easy turn, and not in the direction he wants to go, but still a viable option. So despite the ugly opening picture, there really is a happy ending. And that's the moral of this tale: As a controller, you constantly have to know what your options are. Pretty much everything we do can be done in more than one way; there's hardly ever only one solution to a given situation. The choice you make this time may not be what you did last time nor what you'll do next time. It all depends on what else is happening, be that airport conditions, other aircraft movements, or just a gut feeling. We're constantly playing a game of "What If": What if Southwest misses the exit; What if United doesn't slow down (and What if he does); What if Delta doesn't have a gate; What if Cactus isn't ready; What if Fedex doesn't see that guy; What if American goes around; What if Speedbird aborts; What if, What if, what if . . .
* - Fun Fact: While 25 Right is our longest runway for departures, Runway 7 Left is the longest for arrivals. This is thanks to the displaced threshhold on 25 Right, and is a favorite "trick question" for one of our instructors. It seems sort of trivial, but I needed to know that for real, early one morning a few years back. Thanks, Mark. 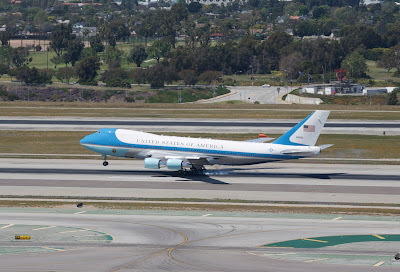 Fun fact: Although Air Force One is a B742, controllers are not required to use the term "Heavy" when talking to the aircraft. Photo credit: I wish I could claim credit for these shots, but this arrival happened while I was at home mowing the yard. Thanks go to Bruce D. from the office for letting me show you these. That said, I'll bet I'm not the only blogger who liked this! The latest news item featuring air traffic controllers does not, for a change, have another tale of yet another controller napping on duty. 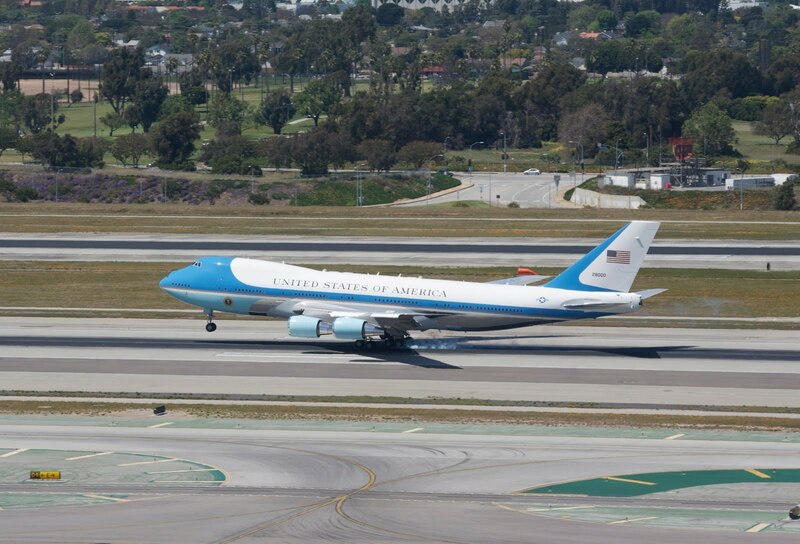 Instead we have a story of the plane carrying the First Lady being told to go-around after coming too close behind an Air Force C-17 cargo plane. 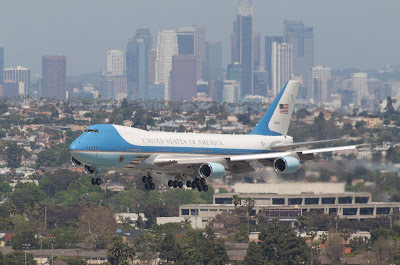 The First Lady's aircraft, a Boeing 737, has to be spaced at least five miles behind the C-17, which is a heavy jet. Long-time readers may recall that I discussed wake turbulence in a multi-part series last year. When the spacing between the aircraft was observed to be insufficient, the B737 was told to go around. So what is a go-around? A go-around is a standard procedure where the pilot of a plane on final approach to landing instead aborts the landing attempt and climbs up and away from the runway. This maneuver may be initiated by the pilot or the controller when conditions are such that a continued approach to the runway would not be safe. While this list is not comprehensive, these are the most common reasons for go-arounds at LAX. While it may sound extraordinary, we see these everyday. At LAX, most are controller initiated due to the preceding aircraft not being able to exit the runway before the next arrival reaches the runway threshhold. Go-arounds are sufficiently common that we have standard procedures for how a go-around is handled. In most cases, the aircraft flies a rectangular pattern that puts it back on final approach to the runway a few minutes later, and it is subsequently able to land without any further incident. What made yesterday's occurrence newsworthy was the personage aboard the airplane. Based upon recent news reports, one could hardly be faulted for wondering if narcolepsy is an epidemic rampaging through the controller workforce. Before anyone takes that comment seriously, let me state that I'm being facetious: Sleeping on the job is a very serious offense for an air traffic controller, and those whose naps made the news recently can expect to face the consequences, which can be as severe as losing one's job. In every tower cab I've ever worked or visited, you can find a coffee maker. At LAX, we have two. Did you ever notice a store display of one of those 5-hour energy formulas and wonder who buys that stuff by the case? Some of my coworkers, that's who. Besides the usual Coke, Diet Coke, Mountain Dew, and so forth, our Coke machine has Red Bull and Monster drinks. We are subject to random drug testing for alcohol and the usual assortment of illegal drugs, but caffeine, guarana, taurine, carnitine, and the other ingredients in the various stimulant drinks and supplements are okay. Obviously, we're not restricted from using stimulant-type products, and there's no shortage of them at many facilities. Why do our controllers feel the need for these things and yet still make the news because they're asleep on the job? What the heck is going on here? Somebody working this schedule ostensibly has a three-day weekend, but also faces the possibility of working two days of overtime in one work week. I was chatting with someone just the other day to whom this happened: He ended up with a 58-hour work week. We are required to have eight hours 'rest period' between shifts, and the schedule adheres to the letter of the rule, as seen above. But I don't live at the airport, although it may feel like it sometimes; nor do any of my coworkers. So figure in a commute home after each shift and another commute to work before the next. An hour commute in LA is nothing special, and we have a number of people for whom only an hour each way is a good day. Thus, for most of us that eight-hour 'rest period' actually equates to maybe four or five hours of sleep. Even if someone can manage on that amount of sleep, this sort of schedule wreaks havoc with your circadian rhythm. One day you're supposed to be up until one or two in the morning; a couple of days later you're having to get up not much later than that. This pretty much whacks your body clock. Calling in sick isn't an option either, as we have specifically been told that 'lack of sleep' is not an acceptable reason for not coming to work. The net result is that most controllers are at times fatigued on the job, working with a sleep deficit, and would probably be diagnosed with having a sleep disorder. Couple that with the reduced amount of airplanes to talk to in the wee hours of the morning (maybe one or two an hour in some places), along with the ban on any sort of non-work related material in the operating quarters (no radio/magazines/crosswords/Angry Birds/etc), and it's amazing that all of us aren't asleep on the mids. The one place I've been where this was not a problem was Memphis, Tennessee -- the home of Fedex. The midshift at Memphis is just as busy, if not more so, than during the day. There is a crew of controllers who work nothing but that shift, every night. During the time I was in Memphis, no one ever had a problem with nodding off in the middle of the night -- we were way too busy! There have been plenty of studies that show that this is pretty much the worst possible way to run a schedule for people who need to be alert at all times while they're on duty. So why do we do this? Basically, I believe it's because it allows a longer 'weekend'. If I get off the mid at 6 am on my last day and am not due back to work until 5 pm on my subsequent first day, the result is that I get what sort of feels like a three-day weekend. Those working the schedule of ten-hour days really do get a three day weekend. That is honestly the only advantage I perceive from the way we're doing this. And up until now, pretty much everybody has 'bought into' doing it this way. We all are aware that it's not ideal, but that longer weekend is awfully attractive, even if we have to sleep for half of it. Because of course we don't sleep through half of it - there's stuff to do, if for no other reason than because you don't have time to do it during the week. What's the solution? Everybody is asking that question right now. My guess is that there will be some sort of mandate requiring longer breaks between shifts. Maybe a limitation on how many different shift start times one person can be assigned within the same work week. Possibly even a requirement that all the assigned shifts within one work week not vary by more than a few (say two or three) hours. Or maybe we should just require all the planes to fly during the day, and let everybody go home at night.